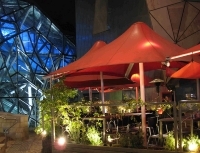 Occupying a whole city block, Federation Square is one of Melbourne's major attractions. A remarkable cultural nucleus, the square hosts more than 2,000 events a year in its outdoor public spaces, St Paul's Court and The Square, and vibrant covered space, the Atrium. Renowned for its unique design, the triangular shapes that characterise Federation Square actually create an abstract map of the Australian Federation. Affording spectacular views of the city, Southbank and the Yarra River, visitors can not only explore the peculiar design of this cultural precinct, but also visit the many galleries, cinemas, museums, restaurants and shops that surround it, most notably the Ian Potter Centre and the Australian Centre for the Moving Image.